Anushka Sharma pays tribute to Abul Kalam Azad instead of APJ Abdul Kalam! Anushka Sharma pays tribute to Abul Kalam Azad instead of APJ Abdul Kalam! 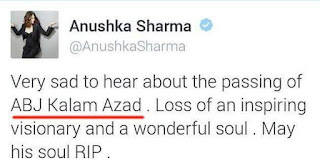 Home > news > Anushka Sharma pays tribute to Abul Kalam Azad instead of APJ Abdul Kalam! 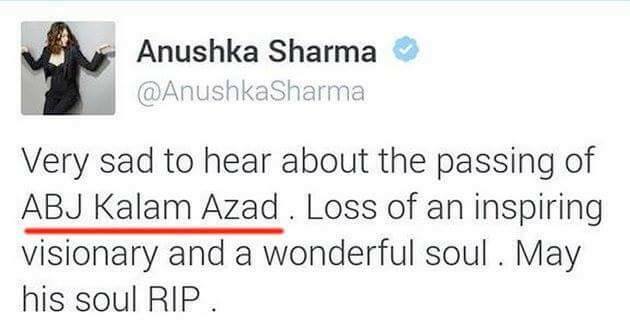 Anushka Sharma pays tribute to Abul Kalam Azad instead of APJ Abdul Kalam! Whole nation is saddened on death of Missile Man MR. APJ Abdul Kalam. Everyone is sharing their sadness through social networks and are changing their DP's with Kalam saahab's photos. But, some people are looking very confused with this matter! They're making spelling mistakes & even they're paying tribute to wrong person! Anushka Sharma did the same on twitter. After Alia, Anushka needs some GK lessons now. Anushka Sharma posted on micro-blogging site "Very sad to hear about the passing of ABJ Kalam Azad. Loss of an inspiring visionary and a wonderful soul . May his soul RIP." Anushka Sharma got Former President Late Dr.APJ Abdul Kalam's name wrong in a tweet. She addressed him as ABJ Kalam Azad! After someone on twitter point out her mistake she deleted her tweet & changed it to APJ Abdul Kalam. Anushka is not the only celeb who did this mistake, But even Farhan Akhtar did so, that too before Anushka Sharma. The multi talented actor first wrote, “Deeply saddened to hear about the demise of one of the most inspirational Indians of r time, former President Dr. APJ Abdul Kalam Azad. RIP.” But within minutes he corrected himself. Farhan was saved in a little of time, but Anushka received a lot of flak! May lord bless our Bollywood Celebs.